The olympic athlete carries his torch up the stairs to light the candle on... the birthday cake! This cute flipbook makes a perfect birthday greeting card or present topper. There’s even room on the cake to write the birthday boy’s/girl’s name on the last frame. Just flip through the book and watch the birthday action. 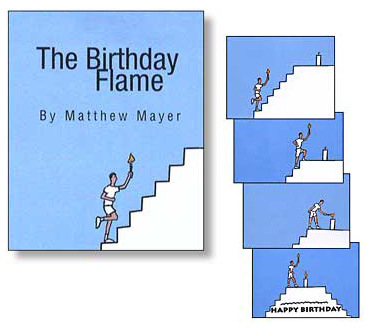 The series of images to the left show the basic story of the Birthday Torch flip book. 2.25 x 2.75 inches.